2. A network technician has issued the service timestamps log datetime command in the configuration of the branch router. Which additional command is required to include the date and time in logged events? 5. What are SNMP trap messages? 6. How can SNMP access be restricted to a specific SNMP manager? Use the snmp-server community command to configure the community string with no access level. Specify the IP address of the SNMP manager by using the snmp-server host command. Use the snmp-server traps command to enable traps on an SNMP manager. Define an ACL and reference it by using the snmp-server community command. 8. What is a difference between SNMP and NetFlow? Unlike NetFlow, SNMP uses a “push”-based model. NetFlow collects more detailed traffic statistics on IP networks than SNMP does. Unlike NetFlow, SNMP may be used to provide IP accounting for billing purposes. 9. How does NetFlow function on a Cisco router or multilayer switch? Netflow captures and analyzes traffic. One user connection to an application exists as two NetFlow flows. On 2960 switches, Netlow allows for data export. NetFlow does not consume any additional memory. 10. Which type of information can an administrator obtain with the show ip cache flow command? 11. What is the most common purpose of implementing NetFlow in a networked environment? 12. Which destination do Cisco routers and switches use by default when sending syslog messages for all severity levels? 13. Which SNMP feature provides a solution to the main disadvantage of SNMP polling? 14. Which statement describes SNMP operation? A get request is used by the SNMP agent to query the device for data. An NMS periodically polls the SNMP agents that are residing on managed devices by using traps to query the devices for data. An SNMP agent that resides on a managed device collects information about the device and stores that information remotely in the MIB that is located on the NMS. 15. A network administrator has issued the logging trap 4 global configuration mode command. What is the result of this command? The syslog client will send to the syslog server event messages with an identification trap level of only 4. The syslog client will send to the syslog server any event message that has a severity level of 4 and lower. 16. When logging is used, which severity level indicates that a device is unusable? Refer to the exhibit. While planning an upgrade, a network administrator uses the Cisco NetFlow utility to analyze data flow in the current network. Which protocol used the greatest amount of network time? Netflow requires both management and agent software. NetFlow can only be used if all devices on the network support it. Netflow can only be used in a unidirectional flow. Netflow requires UDP port 514 for notification messages. 19. When SNMPvl or SNMPv2 is being used, which feature provides secure access to MIB objects? 21. What are the most common syslog messages? 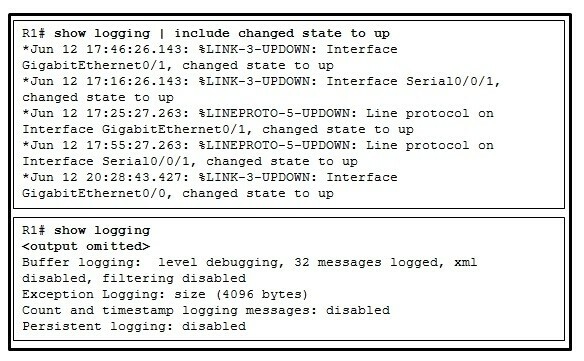 The syslog protocol uses UDP port 514 and is the most common method to access system messages provided by networking devices. Publicado por El Guille en 8/27/2015 11:07:00 p. m.